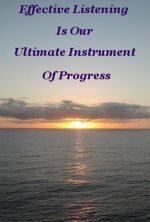 Human intelligence is being exercised with energetic frequency. But as we see here, often ego and greed are favored over accurate thinking. This is something common to our current era. In the mechanical arena, Denis Papin (1647-1712) French mathematician, and Thomas Savery, (1650-1715) a British military engineer, savvy marketer, and author of a book entitled 'The Miner's Friend' were experimenting with steam. Independently of the other. 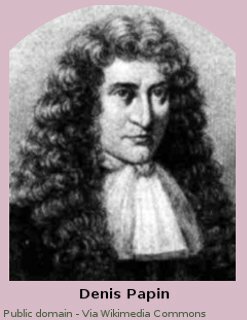 Papin, inventor of the pressure cooker, and assistant to Christiaan Huygens at one time was the first to build a piston steam engine. It seems he could not raise finance for development and the invention lay idle. Savery, who, on the other hand, built a vacuum pump engine, had money of his own to invest in his machine and was well prepared commercially. He was granted a fourteen year long patent on a device to be used to pump water from under-ground coal-mines. While Savery's machine worked it was not at all efficient, and did not possess the capacity to pump water from the bottom of deep coalpits. Savery's inspiration to build his engine may have been the dire need to drain the deep mines of an essential industry in his country, or it may have been mere exploitation of a commercial opportunity. Although his appliance did not perform anywhere near satisfactorily, he was, incredibly, awarded a further twenty one years of patent protection by an Act of Parliament. This protection covered all engines that “raised water by fire”. In an exhibition of blind emotion overruling intuitive Human intelligence, no consideration was given to configuration of the structure of these machines. To put this in context, Henry Ford obtained a patent for the mighty V8 engine layout. 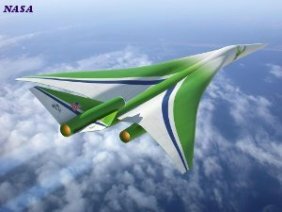 His innovative configuration allowed the engine block to be cast in one piece, which gave him a huge economic advantage over existing designs. This did not prevent the production by others of eight cylinder engines, vee or otherwise, or flat fours or any other form. 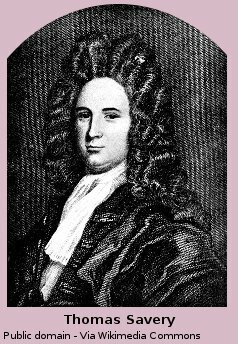 Thomas Newcomen (1664-1729) expanding on the earlier efforts of Denis Papin, spent around ten years building a working model Atmospheric Piston Engine. Generally recognized as the first usable steam engine. Atmospheric meaning that the piston is forced to move with the pressure of the atmosphere bearing down on it at 14.7 lb per sq inch at sea level, and reducing exponentially the higher the elevation. The necessary vacuum that allows this to happen is produced by the condensation of steam inside a cylinder. Even though Newcomen possessed a different and superior concept to that of Thomas Savery, he was stymied by Savery's patent, and was compelled to form a partnership with him. Subsequently it was Newcomen's engine that was used to dry out the mines. Thomas Newcomen had no alternative if he were to commercialize his own design. A compromise of the type that is still common today when participants in deals relegate their Human intelligence in favor of greed and egoism. Not withstanding the superiority of the Newcomen engine over the design of the Savery offering, Newcomen's engine was not a model of efficiency. 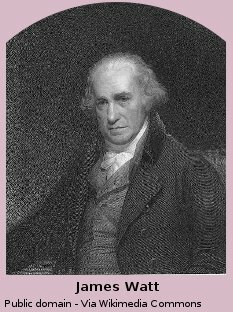 It required a mind of the caliber of James Watt, (1736-1819) to modify and improve Newcomen's engine to the stage where it was a worthy candidate to be put into reliable industrial service. Watt, a mathematical instrument maker by trade, who could turn his hand to repair almost anything, was an intuitive inventor of the first order. It could be said that his improvements to the Newcomen Engine provided the power that kicked started the Industrial Revolution. James Watt, a genuinely admirable man, would have felt quite at ease in the company of other Good Humans like his American contemporary Benjamin Franklin. The SI unit of Power, the Watt, was named after James in his honor. With James Watt at the helm, Steam became king and the driving force of industry. James Watt was in charge of both his ego and Human intelligence.